Trax was founded by Larry Sherman and Rachael Cain in Chicago in 1984. The label released classic early house from the likes of Virgo, DJ Pierre, Frankie Knuckles and Larry Heard and influenced the development of acid house. 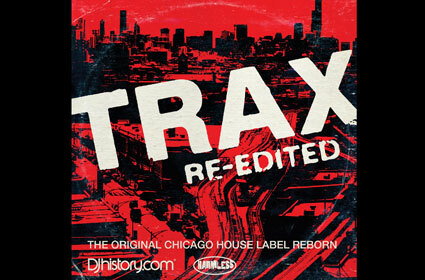 Trax Re-edited is a new compilation refreshing some of the house tracks released on the label. Artists such as Ray Mang, Mark Broom, Greg Wilson and Neville Watson have created new interpretations of tunes such as R U Hot Enough, Can You Feel It and Pump Up Chicago. The album has been lovingly compiled by Bill Brewster and Frank Broughton, co-authors of Last Night A DJ Saved My Life and the pair behind the DJ History website. �The fact there were few multi-tracks remaining and most of the original master tapes had either been wiped or lost was a shame, but it also meant that the producers who worked on the project would have to be resourceful, eking out juice from limited resources. We�re confident that, although they�ve been meddled with, the meddling has been done with such care, love and respect that we�ve merely rejuvenated them for modern dance floors,� commented Brewster about the project.